It is true that we have become a world of politically correct speech and everything must have a name. However, it should also be noted that there truly are conditions which need to be understood. Autism is something that is having more education and awareness brought to the forefront of the medical community, and along with this education includes studying the spectrum of pervasive developmental disorders that fall into the autism scale. One of these conditions is known as Asperger Syndrome. To look at a child that has this condition, one would not see anything on the outside that indicates anything other than the norm. This is true with many of these psychological disorders that seem to have skyrocketed in diagnosis during the last half century. However, to look beyond the surface is to see a mind that is highly functioning and yet far from typical. 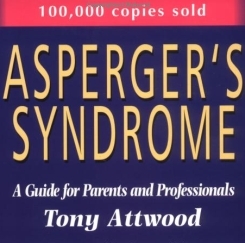 The term Asperger Syndrome, or Asperger Disorder, was first used in the early 1980’s by the psychiatrist Lorna Wing in a written case study. Dr. Wing is also the mother of an autistic child, so her interest in studying the symptoms and history of others who had previously studied was very strong. The name comes from one of the first pediatricians to actually start charting the behavior and study patterns of children that had atypical patterns of speech and social interaction – an Austrian doctor named Hans Asperger. One of his first studies was done during wartime in 1944. He wrote of four children who were patients of his that exhibited a sense of ‘disconnect’ with other children. They were unable to read simple body language cues and were often very uncoordinated physically. By this time, autism had been recognized, and with no other condition that was comparable, Asperger referred to the disorder as ‘autistic psychopathy’. He also believed strongly that they not only had a place in society, but were indeed capable of great achievements under the right circumstance. The paper was not widely circulated and was written in German, but when Dr. Wing read it, she was inspired to write her own paper from this early study of high functioning autism. The official diagnostic name came about in 1992. Since then, more attention has been paid to Asperger Syndrome and how to detect the signs early on so therapies and treatments can begin. Asperger Syndrome often makes itself known to parents when their child starts any kind of pre-school or setting where peers are present. 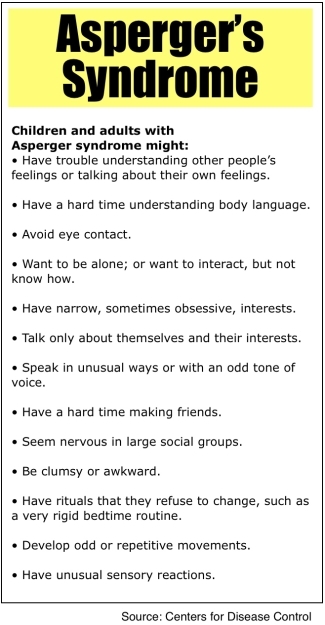 Children with Asperger’s are likely to have a lot of trouble adjusting and don’t interact well with others their age. There is a ‘blank’ effect when exposed to anyone else’s pain or discomfort – in other words, they lack any real empathy for others. They don’t react well to changes in routine and will often miss the cues of body language or a change in a person’s tone of voice. For example, if the child is misbehaving and the parent speaks in a firm, loud voice telling them to stop, the response will likely be to continue the behavior. They simply don’t ‘get’ that changes in tone can mean anything significant. In a bit of a twist, while the child may not be developing at the typical rate socially, they often exceed in other areas. The speech of a child with Asperger’s is not the usual way children of their age group speak. They will often use old-fashioned, formal words that almost seem to be more appropriate for another time period. Rather than saying “I am here” they may say something such as “I have arrived”. Another aspect is the ‘one sided’ conversation. Children with Asperger’s will often be very knowledgeable on one particular thing such as space travel or a time in history. They will talk incessantly about that one subject, but when the attempt is made to divert the child’s attention, they will often stare blankly and not respond. Motor skills in children with Asperger’s are often delayed. Simple tasks may take longer to learn such as handwriting and using food utensils, and the walking is often awkward and unbalanced. There is also the possibility that the child will have a more intense reaction to heightened stimulation such as bright lights or sudden loud sounds. When a parent hears that their child has any type of developmental delay, the first question is often “Why?” As with many pervasive developmental disorders, the actual cause is not known. There are many theories, one of the most prevalent being that there is a genetic link. When Hans Asperger was studying his patients that all had these similar traits, he also found that there were less obvious traits in family members, in particular the fathers. Research is being conducted daily, however at this time there has not been a specific gene determined that is a common link in children with Asperger’s. One of the reasons that the theory continues to be studied is because of the genetic links that have been found in some cases of autism spectrum disorder. While Asperger’s does fall into the spectrum of autism, it is considered unique in the way it manifests itself. Along with the studies of genetic links, there are also the possible connection to teratogen exposure. These are the components that cause certain birth defects, usually within the first two months of conception. Environmental factors have also been theorized, but there is nothing conclusive at this time. The fact is, as much as we have learned about the brain and central nervous system, we are light years from truly understanding what can cause someone to be ‘wired’ differently. What is known is that it seems to show itself early on with speech and social development delays. Until the answer of ‘why’ can be determined, what doctors and other medical professionals are focusing on is how to manage the disorder. Asperger’s children have their own unique set of challenges when dealing with the day to day routines. They will likely not share or play very well with others and will not react to another’s pain or happiness. Along with these challenges, many children with Asperger’s have areas where they not only excel, they can reach genius levels. Dr. Asperger noted that his students were ‘little professors’ and felt that they had every chance of success if given the right opportunities. What is important to note with those who have Asperger’s is that ‘natural’ social skills that come from typical child development need to be taught on a consistent basis. As with any pervasive psychological disorder, the earlier the diagnosis and treatment, the better. There is no one way to treat Asperger’s as it varies from each individual. The important thing is to remain on a routine that a child feels comfortable with and with the right therapy, many of them grow up to be fully functioning adults capable of relationships and successful lives. Occupational therapy as well as physical (if needed) and cognitive behavior therapies are done on a daily basis, with consistency and structured routine in the early years. Structured routine is not to be confused with the repetitive routine of some of the obsessive behaviors in Asperger’s children. These behaviors keep them from being able to focus on other things they need to be learning. Their obsessions, such as building, designing, or learning about one certain subject can be channeled in their favor, but only if it is met with a balance. Medications are sometimes given to Asperger’s children, but only if there is another diagnosed issue such as Attention Deficit Hyperactivity Disorder or debilitating anxieties. Medication should be monitored closely and should never take the place of the extensive therapies needed. Most importantly, the child needs parental support and encouragement. The parents should be working along with the therapists to keep the routine consistent. In these days of over-diagnosis, especially with children’s behavior disorders, it is important to remember that there was a time when anyone who did not fit in with the norm of how people were expected to act were often outcasts. Perhaps some of the misunderstood geniuses of the past had some of the same traits as what we now call Asperger’s. Most likely it is our own need to give a name to something… and to try to understand it further once it can be identified. In the long run, it is much better to overdo it than to not do anything at all.